It’s a painful thing to discuss 21st Century American military history; the relatively small percentage of Americans who participated in the wars in Afghanistan and Iraq have experienced something the rest of us will probably never understand or fully appreciate. 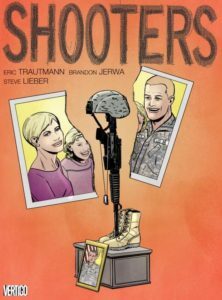 All the same, serious works like Shooter try to capture the stress and strange isolation that comes from serving in a messy, unclear war. This is also the first graphic novel I’ve seen that takes a mature look at the rise of “Blackwater”-style mercenary groups. “Just because we’re on the same side doesn’t mean we’re on the same team.” This quote from page 104 from Shooters perfectly captures the theme of the book. Over the course of the story, we watch soldier Terry Glass live out a series of betrayals in every aspect of his life. We witness his journey, fraught with dissatisfaction and dead-ends, from soldier to forgotten veteran to private military contractor. This is not a feel-good story, but it is required reading for anyone who wants a glimpse into the psyche of a modern soldier. These topics need to be discussed, and I’m glad that Trautman and Jerwa were bold enough to delve into such pain to find the story worth telling.